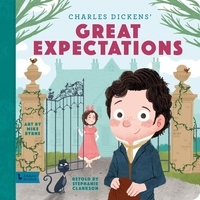 In Great Expectations: A BabyLit Storybook, preschoolers follow Pip's story, learning about the value of family and friends, fortune and loss, and love. Easy-to-follow, engaging text combined with original quotes and beautiful artwork create a book to be treasured through childhood and beyond. Mike Byrne lives in the Surrey countryside with his wife, cat, and two young sons where he spends his days doodling and illustrating children's books fuelled only by tea and biscuits. Mike is the illustrator of Sproutzilla vs. Christmas and My Colourful Chameleon.